Education is a life-long pursuit. This past week, I passed my exam for Accredited Investment Fiduciary certification. For those of you wondering what AIF stands for after my name, now you know. An inverted yield curve is normally a harbinger of an economic recession, and while the future is unknown to us all, there seem to be few signs of a recession in our near future at this point.2 In my opinion, we should experience a temperate investing market for several more months ahead, giving us hope to recoup some losses and reap gains before we may likely have reason to retreat to higher ground once again. This is not a green light on any and all investments while turning a blind eye and deaf ear to investment risks. It is, however, a reason to shift moderately back into the water in a cautiously optimistic manner with one eye on the horizon and one on the ground below. Dorsey/Wright and Stormguard are both showing that the market conditions are favorable for investing into equities and riskier assets compared to bonds, cash, and alternatives at the moment. 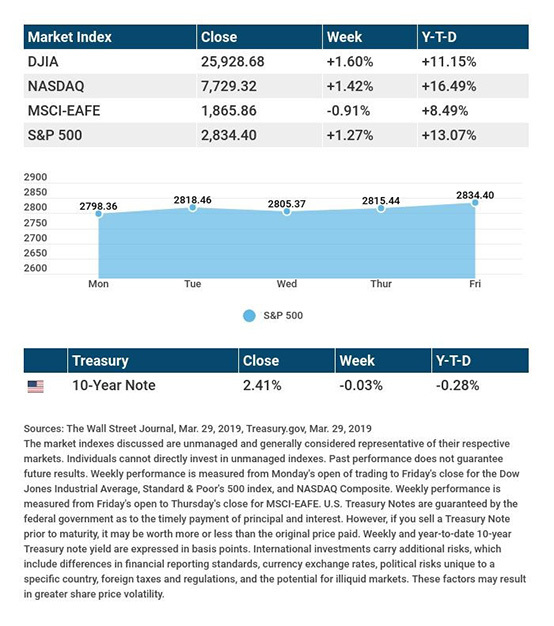 We have been investing and rebalancing for clients since late January under the belief that the Trade War will be resolved, the Fed will reduce the frequency of interest rate advances, and that Brexit would be fixed as well.4 So far, 1 out of the 3 has proved correct, and we will continue to wait on the other 2 (trade & Brexit) to be sorted out-we hope sooner than later. Till we speak again, enjoy this spring-like weather! BTW: I will be out of the office on business next Monday - Tues and returning Wednesday. There's plenty of great information out there to increase your drive and crush that long ball. But what about when you need to hit your longer irons at a solid rate? It's important to take the club back easy on your backswing. You'll be in a better mood. It's true - regular walking modifies your nervous system to help decrease negative feelings. Walk with a friend and get even more calming benefits from the added social interaction. Pump your "second heart". Walking strengthens the venous system that relies on muscles, veins, and valves in your feet and legs that work together to get blood pumped back to the heart. If you're just getting started in a walking routine, start slowly and set yourself up for success. Even walking a block is better than nothing. If you have any health concerns, be sure to check with your doctor first before starting any exercise routine, including walking! Dorsey, Wright & Associates, LLC is a subsidiary of Nasdaq, Inc. Nasdaq, Inc. is a publicly-traded corporation (NDAQ). Its subsidiaries include The Nasdaq Stock Market LLC, Nasdaq PHLX LLC and Nasdaq BX, Inc., all of which are SEC-registered national securities exchanges, Nasdaq Execution Services, LLC, a registered broker-dealer that routes orders in equities and options to the appropriate market center for execution, Chi-X Canada ATS Ltd., a Canadian alternative trading system for the trading of TSX and TSXV-listed securities, and Nasdaq Futures, Inc., a CFTC Designated Contract Market for the trading of energy futures in oil, gas, and U.S. power. Nasdaq, Inc. also has subsidiaries that are foreign securities exchanges that receive listing and trading fees. Dorsey Wright will not publish research or make recommendations concerning NDAQ, nor trade the security for its Investment Management clients. Dorsey Wright may, however, publish research on, recommend or trade other securities listed on the Nasdaq exchanges, which receive fees from the listed companies and futures. Dorsey Wright will not take into account where a security is listed or traded in exercising its independent judgment for clients. In addition, Dorsey Wright does not manage or control where clients' broker/dealers route orders for execution. Accordingly, client orders may be routed to the subsidiaries of Nasdaq, Inc. for execution. These markets receive trading fees. Nasdaq, Inc. and its subsidiaries receive index licensing fees from investment product sponsors, as well as index calculation fees from index providers. These fees may be asset based. With respect to ETFs and other investment products for which Nasdaq, Inc. or its subsidiaries may receive licensing or asset-based fees, Dorsey Wright may, from time to time, (i) recommend such an ETF or other investment product in research for which Dorsey Wright receives fees; (ii) include such an ETF or other investment product in models or indexes for which Dorsey Wright receives an asset based fee; and/or (iii) recommend or include such an ETF or other investment product in the investment management accounts. While Dorsey Wright does not receive any portion of Nasdaq's fees directly, the firm may indirectly benefit as a subsidiary that is part of a Nasdaq business unit. To manage this potential conflict of interest, in the case of Dorsey Wright research or index and model licensing, Dorsey Wright would only include the Nasdaq investment product if the product helps to meet the stated objectives of the strategy and it otherwise meets the rules-based methodology associated with the strategy. In the case of the investment management accounts, Dorsey Wright will only recommend or include the Nasdaq investment product when the recommendation is suitable and meets the client's stated investment objectives. Dorsey Wright will not take into account the fees received by Nasdaq, Inc. and its affiliates in exercising Dorsey Wright's independent judgment for clients. Some performance information presented on this website is the result of back-tested performance. Back-tested performance is hypothetical and is provided for informational purposes to illustrate the effects of the strategy during a specific period. The hypothetical returns have been developed and tested by DWA, but have not been verified by any third party and are unaudited. Back-testing performance differs from actual performance because it is achieved through retroactive application of a model investment methodology designed with the benefit of hindsight. Model performance data (both back-tested and live) does not represent the impact of material economic and market factors might have on an investment advisor's decision making process if the advisor were actually managing client money. Past performance is not a guide to future performance. Future returns are not guaranteed, and a loss of original capital may occur. There are risks inherent in international investments, which may make such investments unsuitable for certain clients. These include, for example, economic, political, currency exchange, rate fluctuations, and limited availability of information on international securities. DWA, and its affiliates make no representation that the companies which issue securities which are the subject of their research reports are subject to, or in compliance with certain informational reporting requirements imposed by the Securities Exchange Act of 1934. Sales of securities covered on this site or in this report may be made in only those jurisdictions where such securities are qualified for sale. Investors in securities with values influenced by foreign currencies, effectively assume currency risk, because foreign-currency-denominated securities are subject to fluctuations in exchange rates that could have an adverse effect on the value or price of, or income derived from, such securities. Options trading involves risk and is not suitable for all investors. When participating in a covered call strategy, the investor is at risk of having to sell the stock if the stock's price rises above the strike price. Remember, in exchange for receiving the premium of having sold the calls, the investor is obligated to sell the stock if the option is exercised. The relative strength strategy is NOT a guarantee. There may be times where all investments and strategies are unfavorable and depreciate in value. There may be instances when fundamental, technical, and quantitative opinions may not be in concert.